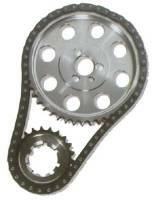 JP Performance make a large range of timing chain sets for V8's, six and four cylinder engines. JP Performance Billet Double Roller Timing Set - SB Ford 302, 351W Non EFI, Reverse Oiler -.005"
Pit Stop USA is The Online Motorsports Superstore! We feature JP Performance Products Billet Timing Chain Sets. JP Performance Products hardens all crank sprockets for all chain sets, crank gears for full steel timing gear sets and oil pump drive gears. Induction hardening is used to improve tooth life of gears and sprockets as well as pre-work hardening gears and sprockets before they are installed onto engines. Induction hardening is a process where steel is hardened by means of induction heating and subsequent quenching in water. 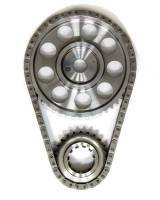 JP Performance make a large range of timing chain sets for V8's, six and four cylinder engines. They are machined from billet steel and turned for greater accuracy on CNC machinery. 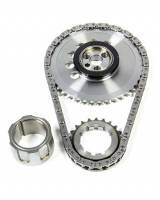 JP Performance Timing Chain Sets are supplied with induction hardened and multiple keyway crank sprockets (which have the keyways index marked for easier timing) and balanced camshaft sprockets and a true roller timing chain. Also all sets for engines without factory fitted thrust plates (i.e. Chev V8's and Chrysler big block V8's) are machined with a reverse oiler groove. For those that require a Torrington bearing fitted (such as race engines) then JP Performance Products also have them available. Sets fitted with the Torrington bearing are marked 'T'. We feature Performance Products Billet Timing Chain Sets at low everyday prices!